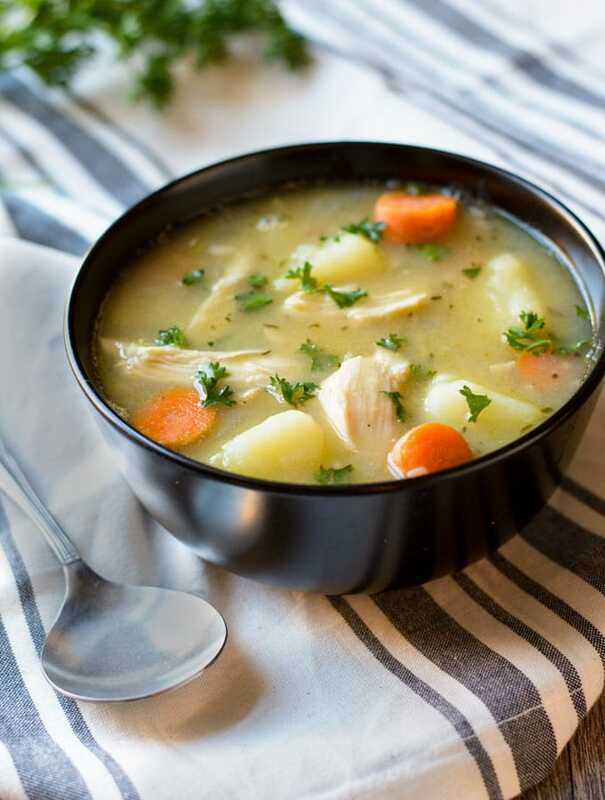 This healthy Chicken and Potato Soup is dairy free and can be done in under an hour! Roasted chicken and tender veggies come together to make one delicious comfort food meal! Well, the Fall temps have finally reached us here in Texas. After a super rainy and humid September, it’s nice to have temps in the seventies and some sunshine this week. And that means it’s time for all kinds of soup making to begin. 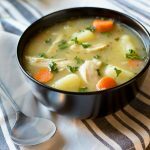 This Chicken and Potato Soup is pure comfort food in a bowl! I prefer to buy bone-in, skin on chicken breasts for soup recipes like this, then remove the skin after it’s cooked. It turns out perfectly moist every time. If you are short on time, you can certainly substitute some store-bought rotisserie chicken. I recently read about a study that showed chicken cooked with the skin on is actually a bit lower in fat and calories after cooking than skinless chicken breasts. Say what?! Apparently, the fat in the breast flows out of the meat while its cooking and becomes trapped in the skin. The chicken skin becomes saturated with fat and retains it once it is removed. Plus, it’s also supposed to be higher in nutrients. Interesting stuff! A good quality store-bought chicken stock can also come in really handy with a simple chicken soup like this. It doesn’t have a ton of spices to add flavor, so it’s important to have the best quality of ingredients. I’m a bit lazy when it comes to making my own chicken stock, so I keep a box or two on hand. For recipes like this Chicken and Potato Soup, I prefer to use the Imagine brand of organic, low-sodium chicken stock. For things like chili, I’m not quite as particular. It’s a hearty soup on its own, but if you happen to have some homemade Skillet Cornbread, all the better! A delicious and healthy main-course soup with lots of veggies. The perfect comfort food soup recipe for Fall and Winter! Preheat oven to 350°F. On a rimmed baking sheet lined with parchment paper, lay the chicken breasts skin side up. Rub them all over with oil and sprinkle salt and pepper on them. Place into oven and roast for 35-40, until done. Remove from the oven and let cool until you can handle them. Remove the skin, pull the chicken off the bones and shred it into bite-sized pieces using your hands or two forks. Cover and set aside. While the chicken is cooling, heat two tablespoons of oil in a 5-quart dutch oven or soup pot over medium heat. Add the onions and celery to the pot and let cook until softened, about 5-6 minutes. Stir in the flour and let cook for 1 minute. Pour in the chicken stock and water. Add the potatoes, carrots, thyme, bay leaf and sea salt to the pot and stir. Bring to a boil, reduce heat to medium-low and let simmer uncovered until potatoes and carrots are tender, about 20 minutes. Remove the bay leaf. Stir in the chicken, let heat through (about 2 minutes), then add fresh parsley and serve. To Make Ahead: You can roast and shred the chicken up to two days before proceeding with the recipe. By Tempie at October 16, 2018 . Works well for cold remedy. Thanks!